Summary Ongoing monitoring of kidney transplants is a widely accepted and practiced part of posttransplantation management. One reason to monitor is to evaluate whether the transplant is stable. The transplant community evaluates stability by checking kidney function. Despite problems with sensitivity and specificity, obtaining serial serum creatinine levels is the most common approach to assessing kidney function. Some programs supplement serial serum creatinine levels with surveillance kidney biopsies. Although not uniformly accepted as beneficial, surveillance biopsies are useful in select subsets of patients such as highly sensitized recipients. Recent biopsy studies shed light on which histopathology findings portend poor prognoses. The Long-Term Deterioration of Kidney Allograft Function Study (DeKAF) and similar studies that will prospectively evaluate therapeutic interventions should help the transplant community better define how to monitor and manage the kidney transplant optimally. In the meantime, Kidney Diseases: Improving Global Outcomes (KDIGO) provides an evidence-based approach toward monitoring and managing the kidney transplant. The goal of kidney transplantation is to provide kidney replacement therapy. One of the basic tenets or assumptions in the transplant field is that the healthier the kidney transplant, the longer that the transplant is likely to function, providing dialysis relief. Kidney transplant allograft health can be evaluated using a variety of benchmarks. The most basic goal of a kidney transplant is to provide the recipient with sufficient function to avoid dialysis. Whatever surrogate measures we use to assess graft health, we are always working to stave off graft loss and maximize graft survival. A benchmark such as serum creatinine is an indicator of the level of graft function, but it is also a clue to the risk for graft loss. Data from the Scientific Registry of Transplant Recipients (1) indicate that median graft survival varies with a number of factors, including the type of donor. The Scientific Registry of Transplant Recipients data show us that that median patient survival exceeds graft survival. In other words, most allografts do not function for the remainder of a recipient's lifetime. The scenario in which the allograft functioned for the remainder of the patient's lifetime, so-called “death with a functioning graft,” may be an instance in which the patient died prematurely. However, given that grafts usually do not survive the lifetime of the patient, it is usually the allograft that dies or fails prematurely. Kidney transplant grafts fail for a variety of reasons. Being able to identify a predominant cause could facilitate the development of strategies that specifically target that process and potentially improve graft survival. Much of our effort in the kidney transplantation field is directed toward reducing the incidence of allograft rejection. With this in mind, it is reasonable to consider whether acute rejection is the predominant cause of graft loss. Work done by Meier-Kriesche et al. (2) suggests otherwise. In Figure 1, the incidence of rejection at 0 to 6, 6 to 12, and 12 to 24 months after transplantation during a period between 1995 and 2000 is examined. Two patterns emerged: Rejections in the early posttransplantation period occurred more frequently than later ones, and the incidence of early as well as late rejections decreased in frequency over time. The latter observation is helpful in determining the importance of acute rejection in allograft failure. If acute rejection were causing the majority of allograft loss, then graft survival should be improving during the time that the rejection incidence was noted to drop. This work by Meier-Kriesche et al. demonstrates that graft survival did not improve during the period in which rejection decreased. Thus, acute rejection does not seem to be the major cause of graft failure in the current era. 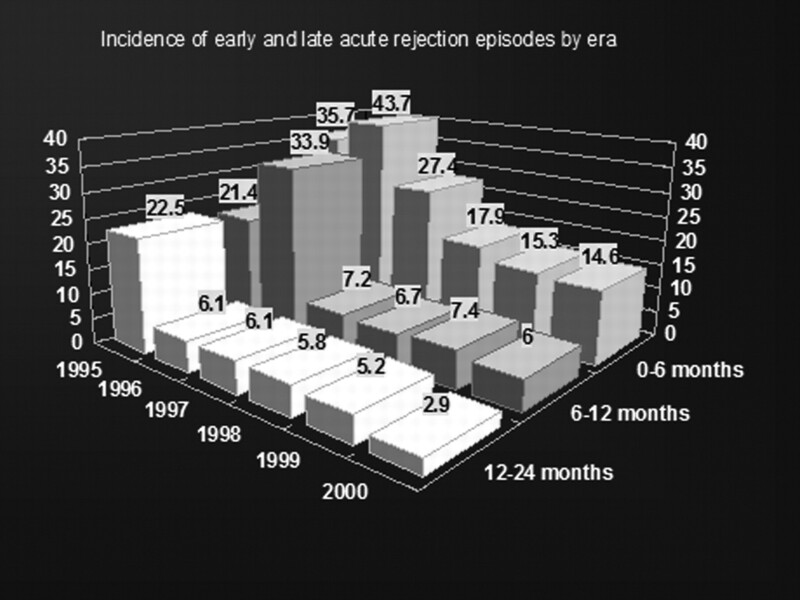 Incidence of early and late acute rejection episodes by era. Graft failure mainly results due to causes other than acute rejection. El-Zoghby et al. (3) examined this when they analyzed 1317 kidney allografts that were transplanted between January 1, 1996, and July 1, 2006, and followed up for 50.3 ± 32.6 months, during which time 330 grafts were lost. The causes of graft failure are shown in Figure 2. Most of the transplants failed due to a glomerular cause and interstitial fibrosis tubular atrophy. Given the premature graft loss, we must conclude that our monitoring and/or management strategies are not working optimally. Ongoing monitoring of kidney transplants is a widely accepted and practiced part of posttransplantation management. One purpose of monitoring is to evaluate whether the kidney is stable by checking kidney function. If the kidney function seems stable, then we assume that the risk for an ongoing intrinsic process is low. However, if our measures indicate that the kidney is not stable, then we consider what may be going on in the allograft. We consider whether there is an acute or a chronic process, whether the underlying process causing the instability is reversible, and whether or how the process will affect the long-term graft survival. It is important to be able to diagnose accurately kidney allograft trouble early or, at the very least, before it is too late to reverse the process. Graft function is commonly monitored by comparing serial serum creatinine levels. Widely used as it may be, it is worth considering whether the serum creatinine is the best means of assessing graft function in the transplant patient with graft dysfunction. Alterations in the serum creatinine are not specific. A change in the level may indicate an intrinsic process such as acute rejection (which can happen at any time after transplantation), renal artery stenosis, chronic allograft injury, recurrence of original disease, a de novo kidney disease, or a transient process. The last may include acute calcineurin inhibitor toxicity and/or volume depletion. This lack of specificity brings into question whether serum creatinine should be the test of choice for monitoring grafts. Serum creatinine is not the only available kidney function measure. One could obtain 24 hour urine collections for creatinine clearance. And other tests could be used as proxies for GFR, including inulin clearance, iothalamate clearance, and iohexol clearance. The advantage of these approaches is that they provide more accurate measures of allograft GFR than the serum creatinine. Comparing serial measurements of GFR will give a better assessment of whether kidney function has actually changed. However, from a practical perspective, using these tests has some disadvantages. They are expensive, not universally available, and logistically cumbersome to obtain once, let alone repeatedly. Additional methods for consideration include cystatin C and repeated 24-hour urine collections to evaluate tubular function through urinary acidification defects and tubular phosphate. These approaches are undermined by a paucity of studies in the transplant setting. Yet another approach is to follow patients with estimated GFRs (eGFRs). However, this approach has drawbacks. White et al. (4) reviewed 23 studies that enabled eGFR calculations for 3487 transplant recipients ≥6 months after transplantation and found reduced accuracy of the eGFR equations, with evidence that the equations could both overestimate and underestimate measured GFR. They also found limitations to the studies, making it nearly impossible to evaluate the accuracy of the equations. Other researchers have found that the accuracy of the equations is affected by the level of kidney function (5) as well as steroid use (6). Kukla et al. (6) found that eGFR as assessed by the Cockcroft–Gault equation and eGFR calculated by the Modification of Diet in Renal Disease (MDRD) equation are closest to measured values. However, whether eGFR is an accurate measure for GFR and a useful monitoring tool in the transplant setting is unsettled. Kidney Disease: Improving Global Outcomes (KDIGO) did not recommend eGFR as a monitoring tool because the KDIGO workgroup noted that “it is unlikely that these formulas will improve the ability of serum creatinine to estimate acute changes in kidney function” (7). Determining eGFR does allow for the assignment of chronic kidney disease (CKD) stage. Although CKD staging in transplant patients may not have exactly the same implications as it does in the nontransplant population (8), it may have prognostic value when considering graft outcome (9) and may be useful as an indicator of the presence of other associated complications, such as hyperphosphatemia, anemia, and systemic arterial hypertension (10). However, the KDIGO Controversies Conference that examined the definition, classification, and prognosis of CKD and is the basis of the revised CKD staging classification did not include kidney transplant cohorts (11). Thus, whether use of a new staging system will be applicable to the transplant patient will continue to be questioned, just as it had been for the initial staging system. Given the alternatives, measuring serial serum creatinine levels remains the standard by which we routinely assess kidney function in the kidney transplant patient. The limitations of using serum creatinine as a biomarker for graft pathology have not gone unnoticed by the transplant community. Yilmaz et al. (12) studied this issue and found that with respect to chronic allograft nephropathy, serum creatinine levels and eGFRs were poor predictors of the early histopathologic changes. Some transplant programs supplement serial creatinine levels with biopsies in their monitoring strategy. A study by Mengel et al. (13) in Hannover, Germany, found that the presence of persistent inflammation (below the Banff level for a rejection) seen on 833 protocol biopsies performed within the first 26 weeks of transplant may correlate with decreased renal function after 1 and 2 years. In another study, Cosio et al. (14) found that fibrosis, inflammation, and glomerulopathy on surveillance biopsies performed 1 year after transplantation predicted a decline in kidney function and graft failure independent of graft function at the time of biopsy. However, the enthusiasm for protocol biopsies as a prognostic indicator must be balanced against the findings of a multicenter study performed by Rush et al. (15). In that study, 121 patients were randomly assigned to biopsies at 0, 1, 2, 3, and 6 months, and 119 patients were randomly assigned to biopsies at 0 and 6 months. Rejection episodes and subclinical rejections diagnosed in the former group were eligible for treatment at the investigators' discretion with methylprednisolone and or antilymphocyte agents. The study showed that when patients are immunosuppressed with a combination of tacrolimus, mycophenolate, and prednisone, the likelihood of finding inflammation on these early protocol biopsies is low. The authors concluded that with our current immunosuppression, therapies protocol biopsies may not be useful because not enough reversible pathology is found on protocol biopsies to allow early intervention to improve the outcome significantly. Also, there are limitations to what can be learned from transplant biopsies because of sampling error, lack of pathognomic lesions, processes that may be patchy and misleading, and difficulties in quantifying tubulointerstitial scarring. There also are potential negatives of performing biopsies, including slight risk for morbidity (bleeding complications) and the associated costs of the procedure. Most protocol biopsy studies examine results obtained relatively early after transplantation. To test whether later biopsy would be more useful, Wavamunno et al. (16) performed repeated kidney biopsies for 5 years after transplantation and found that in patients destined to develop transplant glomerulopathy, ultrastructural changes were present as early as 1 month after transplantation and that light microscopic changes were seen by 2 to 3 years. The latter is years earlier than reported in indication biopsy studies. Thus, if one were to obtain protocol biopsies, then the study by Wavamunno et al. supports getting them early. At this point, whether to perform protocol biopsies in transplant recipients, particularly in the unsensitized, stable transplant recipient, is controversial. The biopsy results may provide prognostic information, but whether intervention will alter the course of the kidney transplant remains unclear. Although the role of protocol biopsies in treating stable, unsensitized patients is debatable, there may be subsets of patients who could benefit more from this procedure. In some patients, the finding of cortical inflammation may give needed direction as to instituting proactive treatment. For example, it may be a useful management tool in patients undergoing immunosuppression minimization, whether on an individual basis or in study settings (17). It also may be useful in highly sensitized patients and those who receive transplants against positive cross-matches. Protocol biopsies may be a more useful tool in this setting because these patients are more likely to have the presence of C4d on biopsies as well as the development of donor-specific antibodies (DSAs) (18,19). Used in this population, the procedure facilitates the diagnosis of subclinical antibody-mediated rejection in an at-risk group. Given advances in treating antibody-mediated rejection (20), making the diagnosis early is desired. Despite this rationale, instituting treatment on the basis of results from protocol biopsies remains to be proved. Time 0 biopsies are another form of protocol biopsies. These biopsies are performed most often when kidneys come from marginal donors. Anglicheau et al. (21) found that time 0 biopsies in combination with assessment of baseline donor characteristics predict graft function and survival. Munivenkatappa et al. (22) found that a score based on the time 0 biopsy findings was predictive of graft failure. Mueller et al. (23) found that transcriptomes from time 0 biopsies were predictive of delayed graft failure. Lin et al. (24) found that time 0 biopsies enabled the successful use of kidneys from deceased donors with high creatinine levels. However, despite the many articles extolling the usefulness of time 0 biopsies in deciding which kidneys to discard or how to place marginal donor kidneys, there is not consistency in how they are used. There also is no consensus on which scoring system to use or validation of a given scoring system at multiple programs (25). Even if a system is universally accepted, there are intrinsic limitations with the time 0 biopsy as a predicative tool because it does not consider recipient factors or events that will occur after the transplant and affect outcome. Indication biopsies, as distinguished from protocol or surveillance biopsies, are still an important and useful monitoring tool. Given the decreasing incidence of acute cellular rejection as a cause of acute kidney graft dysfunction and the increasing incidence of problems such as BK virus (BKV) nephropathy (26), indication biopsies are essential in determining management of acute or even chronic dysfunction in the transplant patient. Nevertheless, progress is being made on urinary assays that can accurately diagnose acute rejection, chronic rejection, and BKV nephropathy. In the future, these assays may reduce the indications for kidney biopsies (27–29). Currently, kidney biopsies remain an important diagnostic tool. Another parameter that would be useful to monitor and gauge is immunologic status. Few assays help with this assessment. One available assay is the Immuknow Cylex assay, which detects cell-mediated immunity by measuring the concentration of ATP from stimulated CD4 cells. Although the test may have a role in identifying overimmunosuppressed individuals at risk for infection and even death (30), its utility in predicting who is at risk for rejection has not been consistently evident (31), and not all insurance companies cover the test. Another test that some groups have examined to assess cellular alloreactivity is the enzyme-linked immunosorbent spot (ELISPOT) assay. This test measures the frequency of peripheral blood lymphocytes producing IFN-γ in response to stimulator cells from the kidney donor or from third parties (32). However, this test is not commercially available. The transplant community looks at end points, such as opportunistic infections and rejection episodes, that indicate whether a patient is over- or underimmunosuppressed. However, these end points can have long-lasting consequences for the graft, and preventing them by immunosuppression adjustments is preferable. It is important to recognize that these end points are imperfect measures of immune status because two seemingly contradictory indicators of immune status such as rejection and BKV nephropathy can coexist (33). Development of or increasing levels of DSAs after transplantation may provide some signals that an individual is at increased immunologic risk (34). However, a study by Gill et al. (35), in which 84 kidney transplant recipients were prospectively tested for the development of de novo anti-HLA antibodies, indicated that routinely testing for anti-HLA antibodies was not a useful predictive test for acute rejection. Further work needs to be done to understand whether and how to monitor DSAs optimally and whether they should be obtained as a screening test at the time of kidney biopsy or in response to findings on the surveillance kidney biopsy. How best to monitor the transplant patient with chronic graft dysfunction is an important yet complex question. The KDIGO workgroup considered the issue of graft monitoring in its 2009 publication on the care of the transplant recipient (7), basing the guidelines on published studies, rated for strength of recommendation and quality of supporting evidence. As shown in Table 1, the KDIGO guidelines recommend monitoring creatinine monthly between 7 and 12 months and then every 2 to 3 months thereafter. Monitoring of other parameters for long-term graft health was also recommended by this group. These other measurements include urine protein; complete blood count; lipid profiles; tests for diabetes, BKV, and Epstein–Barr virus; nucleic acid tests; and checking for tobacco use. Several of these parameters are addressed by other authors in this issue of CJASN. Screening for proteinuria deserves particular consideration. Amer et al. (36) examined the association among proteinuria, graft histology, and survival in 613 kidney transplant recipients with proteinuria and surveillance biopsies. Proteinuria >150 mg was found in 45% of patients and was associated with reduced graft survival with or without the presence of glomerular pathology (36). Increasing levels of proteinuria at 1 year is associated with an increased risk for graft loss over 5 years (37). Screening for proteinuria is particularly important when patients are at risk for recurrent disease, for example FSGS. Because 80% of cases recur within the first month after transplantation, the KDIGO proteinuria monitoring frequency recommendation is weighted heavily toward early after transplantation (daily for 1 week, weekly for 4 weeks, every 3 months for 1 year, and then annually) (7). BKV screening is not specifically addressed, but that does not mean that it is not an important consideration in posttransplantation care. BKV screening has been an effective prophylactic approach in reducing the incidence of BKV nephropathy (38). Screening for BKV is an important part of monitoring, especially within the first year. Monitoring calcineurin inhibitor and mammalian target of rapamycin inhibitor trough levels is recommended despite the lack of randomized, controlled trials comparing monitoring with no monitoring. Monitoring is advisable because low levels are associated with an increased risk for rejection and, conversely, high levels with that of toxicity (39,40). The strength of the KDIGO recommendations is indicated as either level 1 or level 2. The former is the highest level of recommendation (designated as “we recommend”) and the latter weaker (noted as “we suggest”). The level of evidence is graded from A (high quality) down to D (very low quality). In the best of all possible worlds, the published literature that addresses monitoring long-term graft health would be able to generate guidelines of the highest strength and based on highest quality of evidence. Unfortunately, this is not the case. For example, the recommendation to measure serum creatinine is rated 1B and the suggested frequency of obtaining measures only 2C. No 1A recommendations are associated with any of the monitoring kidney allograft function guidelines shown in Table 1. Although intervals for test monitoring frequency are provided in the guidelines, the level of evidence to support this advice is very low, either C or D in all cases. For example, in the case of proteinuria, the suggested screening rates all are rated 2D whether for routine screening or in the high-risk setting of patients who are at risk for recurrent glomerular disease (7). The KDIGO guidelines not only outline recommendations for patient treatment but also they reflect current transplant community practices. Most programs and practitioners monitor transplanted kidneys by obtaining serial serum creatinine levels. With this in mind, let us put into context the creatinine measurement and kidney function after transplantation. Whether 1, 5, or 10 years after transplantation, the GFR based on serum creatinine places the majority of patients into the stage 3T CKD (41). As seen in Figure 3, kidney function is reasonably stable over time with a slight trend toward a decrease over years as indicated by the slight shift to the left (42). Overall kidney function decreases, which translates into a −0.33 ± 0.87 drop during the first 2 years and a −2.68 ± 0.44 drop after that or approximately an overall −1.66 ± 0.51 drop each year. In other words, even in the patient with chronic graft dysfunction, there is a slow but steady deterioration. Some studies indicate that rennin-angiotensin-aldosterone system blockade is associated with longer graft survival and may be a useful tool to retard functional deterioration (43). However, whether we can stop the slow kidney function deterioration depends on the cause of the problem and whether the process is reversible. Kidney function over time. Change in GFR after kidney transplantation. n = 40,963 transplant recipients between 1987 and 1996 in the United States. The mean ± SEM of the change in GFR was −1.66 ± 6.51 ml/min per 1.73 m2. This brings us to the management side of the equation. To manage long-term graft health effectively, we need first to clarify factors that portend a bad prognosis and then institute effective management strategies. Moreso et al. (44) found that biopsies that showed the combination of interstitial fibrosis/tubular atrophy and subclinical rejection had the worst prognosis. However, we are only at the very beginning of identifying when and how to intervene. We still need more answers so that we can both identify grafts at risk and effectively reverse the underlying process. Studies such as the Long-Term Deterioration of Kidney Allograft Function Study (DeKAF) should help. The premise of DeKAF is that the study of new-onset late graft dysfunction can allow categorization into distinct clinical and histopathologic subsets with reproducible phenotypes. DeKAF is a multicenter observational study at seven centers in the United States and Canada with two cohorts: A cross-sectional one enrolls patients who received a transplant before October 1, 2005, and are developing late graft dysfunction leading to biopsy, and a second, prospective cohort of patients who are entered at the time of transplantation. The purpose of the study is to identify and characterize the cause of late (defined as >90 days) kidney allograft dysfunction and failure. More specific, the study aims are to define individual histologic phenotypes (based on Banff scores) to identify those at risk for graft loss. The goals include finding risk factors and expected outcomes for each phenotypic category and testing potential interventions to improve long-term graft health. Early results from DeKAF indicate that histopathologic clusters exist in patients with late-onset graft dysfunction and have prognostic value unlike the diagnosis of chronic allograft nephropathy, which does not help predict outcome (45,46). DeKAF is also revealing that antibody injury (as manifested by C4d staining) in patients with new-onset late graft dysfunction often leads to graft failure (47). Grafts from recipients with similar biopsy findings but without evidence for antibody-mediated injury remain well preserved. DeKAF is demonstrating that as causes of late graft dysfunction, nonimmunologic issues are secondary to immunologic insults. DeKAF findings emphasize the importance of graft inflammation whether in an area of scarring and tubular atrophy or in areas of preserved parenchyma (48). As DeKAF data are obtained and other studies are done, we will be able to define how to monitor and manage long-term graft health more effectively. Optimally, we will have sensitive and specific noninvasive tools to diagnose the presence of parenchyma inflammation and fibrosis or perhaps even be able to identify individuals who are at risk for inflammation. To manage long-term graft dysfunction effectively, we also need to manage immunologic perturbations better. Whether that means tailoring the intensity of immunosuppression to the inflammatory status of the graft (or the patient) or using other strategies that have yet to be defined by DeKAF or other studies, time will tell. In the short term, we should continue to monitor serum creatinine and screen for BKV nephropathy (as well as proteinuria, BP, lipids, calcineurin inhibitor and/or mammalian target of rapamycin troughs, and blood count as outlined by KDIGO and the other authors in this issue of CJASN). Some programs will supplement this screening approach with surveillance biopsies (particularly in the sensitized recipient).